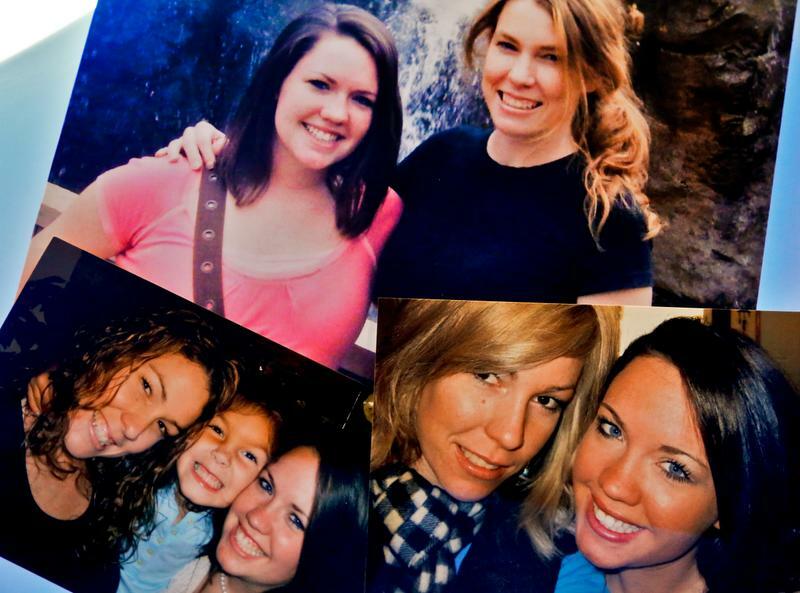 Dannah Krone, seen at top left and bottom right in pictures with her older sister, Tina Orr, and Orr’s daughter Zoey, now 9 — says Orr changed in the final years of her life before she died after a prescription drug overdose. Dannah Krone, seen at top left and bottom right in pictures with her older sister, Tina Orr, and Orr’s daughter Zoey, now 9, says Orr changed in the final years of her life before she died after a prescription drug overdose. Tina Orr always feared she’d follow her father to an early grave. Orr, who lived in northwest Oklahoma City, withered in the last years of her life before succumbing to a prescription drug overdose at the age of 35, her sister, Dannah Krone, said. Orr’s passing, on March 2, 2014, came in what appears destined to become the deadliest month for prescription drug overdoses in Oklahoma since authorities began tracking such deaths in 2001. During the month, 61 Oklahomans died of confirmed prescription drug overdoses, an average of almost two per day. Read the entire “Addicted Oklahoma” series, a joint project by Oklahoma Watch and The Oklahoman. The dead included business owners, nurses and truck drivers. There were carpenters, lawn care workers and electricians. There was a casino worker, a welder and a brick mason. There were moms and dads, brothers and sisters, grandparents and a toddler. One loved the New York Jets, another was a horror movie fanatic and at least one was a big-hearted outdoorsman who loved helping people. There was a classic car restorer, an avid arrowhead hunter and a tornado chaser. Two were high school valedictorians. They were people like Orr, a one-time small business owner bursting with creativity, ambition and kindness who struggled with mental health and substance abuse issues before succumbing to an overdose, just as her father had a decade earlier. Things changed, though, and Orr spent the final years of her life struggling with her weight, a seemingly never-ending series of doctor’s appointments and a growing prescription drug dependence. “We saw her shift to a whole different person,” Krone said. “At one point, she was taking, like, five different medications, but none of them seem to fix what was wrong with her. The deaths came in the midst of an epidemic of prescription drug abuse that now kills more Oklahomans annually than die in car crashes. In recent years, Oklahoma has led the nation in not only unintentional overdose deaths, but also the number of painkiller prescriptions per capita. The Legislature recently approved new laws designed to strengthen the state’s prescription drug monitoring program in a bid to cut improper use. In signing the bill last month, Gov. Mary Fallin predicted it would save lives. Cookson, 23, of Muskogee, served a tour with the Oklahoma National Guard’s 45th Infantry Brigade Combat Team in Afghanistan, beginning in 2011. His obituary said his hobbies included baseball, basketball, collecting coins and Pokemon cards. He also played the guitar and had a passion for skateboarding that resulted in numerous injuries to him, and numerous anxiety attacks for his mom. He died March 8, 2014, surrounded by friends and family. The Oklahoman reached out to several family members and friends of those who died, many of whom declined to comment, saying it was too soon or too hard to talk about their loved one. Tessa Simmons enjoyed dance, swimming and trips to Walt Disney World with her family while growing up in Kansas, according to her obituary. In 2006, she moved to Oklahoma and graduated from Edmond North High School before following in her grandmother’s footsteps as a hairstylist. Simmons, known for her carefree spirit, creative personality and “the ability to put together a wardrobe ensemble in record time and look like a million bucks,” died March 16, 2014. When reached by telephone, her mother broke into sobs. During a brief conversation with The Oklahoman, Simmons’ mother said her daughter was far more than an overdose victim. “She was an aunt … She had two little nieces,” the mother said, her voice trailing off as she began to cry again. She declined to talk further. Even so, many family members said they wanted the story to be told. “I hate that what’s supposed to make you better can kill you,” said one mother, who asked that her name not be used. Sandra O’Hara said two months before he died, her stepson, Ryan Adam O’Hara, invited his family to his baptism. He was working hard to get his life back on track after a long struggle with alcohol. He suffered from depression and anxiety, and he had prescriptions for two antidepressants, nortriptyline and amitriptyline. Sandra O’Hara has worked as a pharmacist for the past 35 years and said she doesn’t understand why anyone would prescribe her stepson both of the drugs. Ryan, who lived in Oklahoma City, likely didn’t know to not take the drugs together, something either his doctor or pharmacist should have told him, she said. “That’s my own profession – that really bothers me,” Sandra O’Hara said. Shortly before his death, Ryan O’Hara had completed two years in a court-mandated treatment program. He had a few run-ins with law enforcement, but the program had helped him get treatment and avoid prison. Ryan O’Hara died just 11 days before his 30th birthday. The dead came from all corners of the state, from Guymon in the arid Panhandle to Stigler in the dense, piney forests of southeast Oklahoma. From Perry in the north to Madill nestled a not-too-distant drive from the Red River. The most deaths occurred in Tulsa County — 16. Oklahoma County recorded 11. Medical examiner records blame the usual suspects for the March 2014 overdoses: Hydrocodone, oxycodone and other painkillers, were involved in many of the deaths. Methadone, an opiate drug used to treat pain and sometimes to help wean addicts off other opiates, contributed to at least 14 of the deaths, the most of any prescription drug. Next in line: hydrocodone, another opiate pain medication marketed under a variety of trade names, including Lortab and Vicodin. It was the principal cause of 12 deaths and contributed to a 13th. Most of the overdose victims died accidentally, according to the state medical examiner’s office. Only four of the deaths were deemed suicides. The calls to the state medical examiner’s office streamed in all month. There were three prescription drug deaths on March 1, two on March 31. The deadliest day was March 27, with six prescription drug fatalities. The dead included 32 women and 29 men. The average age was 43. The oldest fatality was 75-year-old Loretta Forbes of Ada, one of the first calls to come in on March 1. She was killed by an overdose of morphine, another opiate pain medication. She was born in Stratford, a small town about 75 miles southeast of Oklahoma City, was a homemaker and left behind a daughter and several grandchildren. The youngest to die was Blair Helms, 3, of Jenks. She died March 5, 2014, after her mother, 39-year-old Jamie Nicole Helms, gave her big doses of methamphetamine and alprazolam, an anti-anxiety medicine marketed as Xanax. Jamie then herded Blair and her 5-year-old brother into the family car and started the engine inside a closed garage. Mother and daughter both died; the brother was rescued. Blair’s cause of death was listed as toxic levels of carbon monoxide, methamphetamine and alprazolam. The death was ruled a homicide by drugs. At least half of those who died were parents, and many were grandparents. Kelly Ray Prather, 62, of Oilton, was a father and grandfather, remembered for his passion for music. More than half died at home. Others died in motels, at friends’ houses or in a vehicle. Fifteen died in hospital emergency rooms. Ross Martin, 47, died in a Tulsa homeless shelter. The victims found comfort in a number of faiths; Lutheran, Catholic, Baptist and Pentecostal among them. Julie Thompson, 43, of Tulsa, was remembered in her obituary as a certified public accountant who most recently was a stay-at-home mother, volunteering many hours at a Tulsa-area hospice and at her daughter’s school, Metro Christian Academy. “Julie was very active in her church and was a former member of First Christian Church in Miami,” her obituary reads. Some who died during March 2014 had a family history of substance abuse. Amber Bernice Osborn, 21, was found dead at a Moore business on March 7, 2014. Her grandmother, Vivian Osborn, said others in Amber’s family abused prescription drugs. In a telephone interview with The Oklahoman, Vivian Osborn said that she didn’t get to spend much time with her grandchild during the last years of her life because she didn’t allow drug use in her home. At the time of her death, Amber Osborn was making her way through the criminal court system in Oklahoma County. She was mentioned in a report filed by a local TV station after she was arrested in October 2013, along with several others who’d stolen an iPad. Others who died during the month developed a problem with prescription pills following an injury. Kelly Groves, of Kremlin, ran in the 2012 Oklahoma City Memorial Marathon. A week later, a texting teenager slammed into his stopped Jeep at 55 mph. Doctors determined that Groves needed back surgery, replacing a section of his spine with cadaver bone. But his body rejected the hardware, and he needed more surgery. The doctors had planned to finally remove the cadaver bone in April of last year. Groves, a licensed professional counselor and avid sports fan, died a few weeks before the surgery. He was 28. Groves frequently talked about how much pain he was in. The 6-foot-2 father of two girls eventually got to the point where he didn’t realize how many pills he was taking, said his brother, Cody Groves. About seven years before Kelly Groves died, Cody Groves lost his older brother, Casey Groves, to prescription drug abuse. He also died at 28. Cody Groves’ brothers were his best friends. He and Kelly lived a block apart, and they worked in the same office. Kelly got Cody, a licensed professional counseling candidate, interested in working in the mental health field. Krone, whose sister was among the first to die in March 2014, said Orr began her downward spiral in 2008 when her marriage began to crumble. Orr’s mental health declined. She began exhibiting odd behavior. Over the years, Krone said doctors and mental health professionals diagnosed Orr with a variety of ailments and at one time she was on five different prescription medicines. There were suicide attempts. The medications Orr took caused her to gain weight, which she worried about excessively and plunged her further into depression. Krone’s and Orr’s father, Tim Orr, died under similar circumstances on April 30, 2002. Despite all of the challenges, Krone said her final conversation with Orr — about two weeks before she died — was full of hope and anticipation. She had no inkling it would be the last time she spoke to her sister. Now, Krone is left to imagine what could’ve been. A sad end for a woman who feared she’d follow her father to an early grave. At a cemetery in Moore, the two are buried “right next to each other,” Krone said. Contributing: Ruth Serven, staff writer for The Oklahoman. Overdose deaths totaled 864 in 2014, an average of more than two per day.